What is Vertex? Well, geometry class, a vertex is where multiple lines or edges meet up and create an angle. 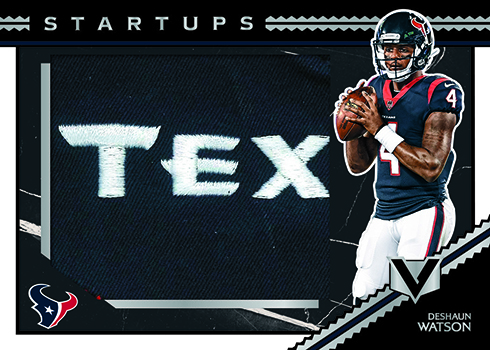 2017 Panini Vertex Football brings together a few different themes to create something new. This includes how the cards are made, their content and the checklist itself. 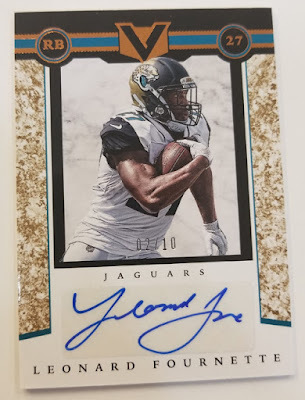 One of the big themes that runs through 2017 Panini Vertex Football is autographs. Each box has four signed cards, at least two of which have on-card signatures. One of those hard-signed cards comes with four memorabilia swatches. 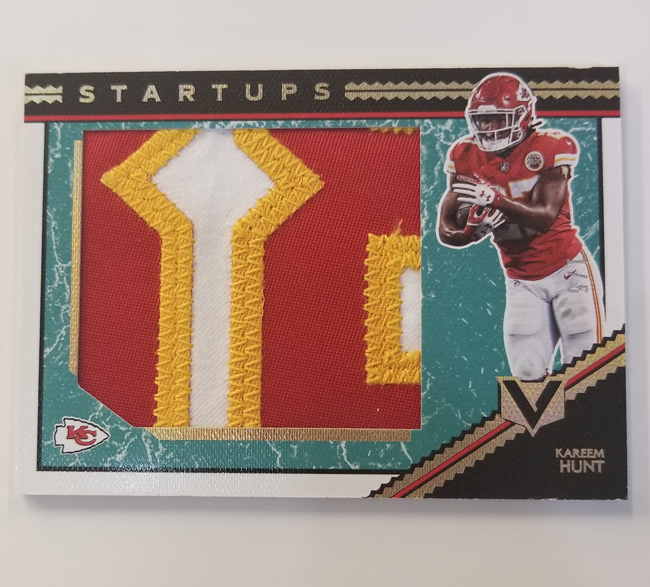 These fall under the Capstones banner, a card style being brought over from 2016-17 Panini Grand Reserve Basketball where they were called Cornerstones. 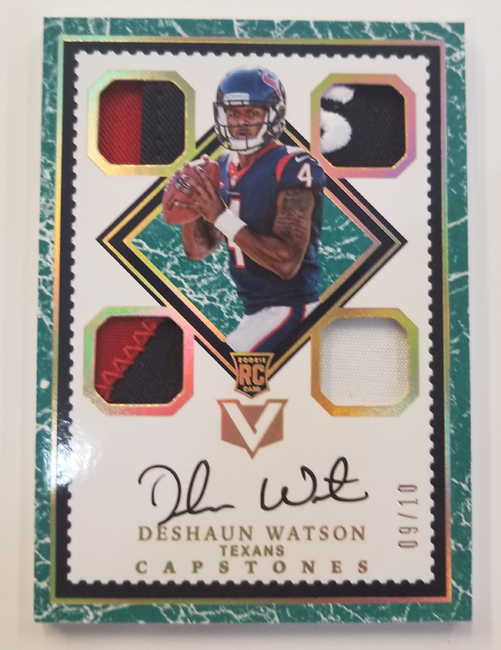 Capstones have separate lists for veterans (Capstones), first-year players (Rookie Capstones) and retired stars (Legendary Capstones). Rather than colors, parallels stick with the rock theme in the form of Quartz, Granite, Marble and Onyx. No matter the type, all Capstones come numbered to 99 or less. 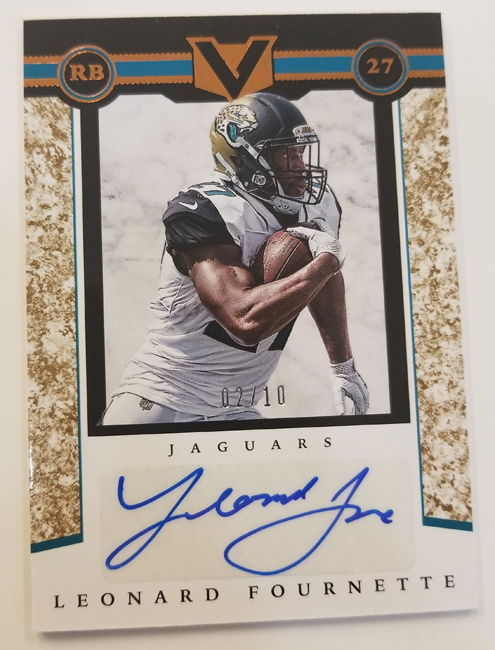 2017 Panini Vertex has several additional autograph styles. These not only mix up things thematically but how the cards are printed. Upper Tier Signatures and the legends-focused Highly Revered (/99 or less) both come with on-card autographs and are on thick holographic card stock. Similarly, there’s Number Ones and One-of-a-Kind. Both of these inserts are one-of-ones in the truest sense. Each card has just one copy and zero parallels. Numbers Ones features first overall picks. One-of-a-Kind includes top players. The Ascent and Difference Makers Autographs use micro-etched card stock. Other autographs in 2017 Panini Vortex Football include Vertex Signatures, Apogee Autographs and Championship Ink (/25 or less). As for memorabilia-only inserts, these are done on embossed canvas. Among them is Startups, which come numbered to 99 or less and have large swatches. Prime parallels for these come in three levels. Memorabilia cards combine to land two per box. 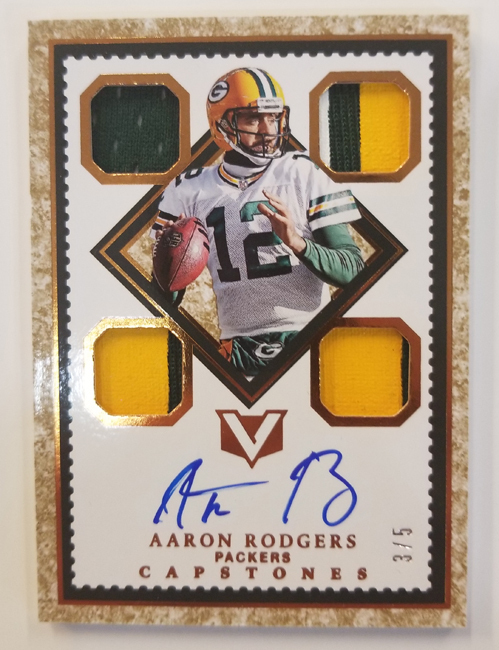 Like a couple of the autographs, regular 2017 Panini Vertex Football inserts use micro-etching. Among them? Past & Present. These use a little image manipulation magic to pit a current star against someone from the past. It’s not just a matter and putting the two images on the same card. These match things up to make it look like a seamless action shot. It’s a concept similar to Collector’s Edge Time Warp inserts from the 1990s. The 2017 Panini Vertex Football base set has a total of 186 cards. It starts with a 100-card shell set. Forty Rookie Capstones are part of the main set. 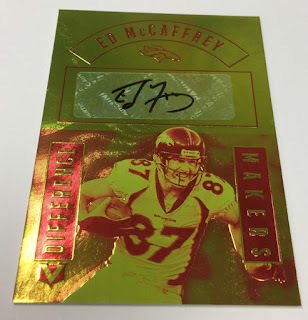 So are the The Ascent autographs, which also highlight first-year players. 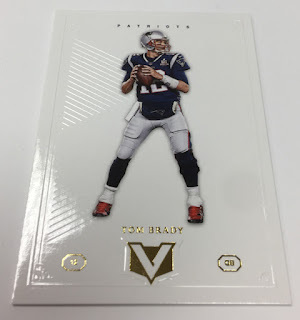 Parallels for the veteran shell set include Quartz (/99), Granite (/10), Marble (/5) and Onyx (1/1).